I rarely enter blog competitions. A few years back I did entered some, though. Blog Pilihan Bahasa Inggeris ke something like that. 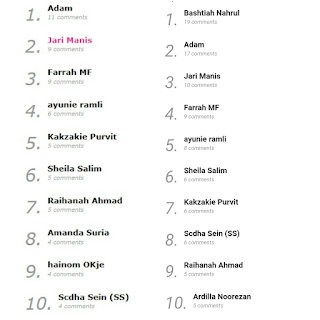 Got tagged to enter a bloglist contest. Rules are simple; follow the blog, post the banner, tag other blogger friends... But ah, I just don't feel like it. Only tried once; to get on Orked @ Sya's bloglist and dah cukup. But this one, Top Commentor Dorsett Pink attracted me. Maybe because it required reading. And also because the blog posts got me interested so I don't mind following and listing her blog in mine. I didn't want to follow a blog that didn't interest me. She's a mother blogger pursuing phD. And so I started commenting on posts that are relatable to my life right now. Pregnancy, breastfeeding, kids... In just 3 days, I'm the top commentor. Hahahah! Gotta hang in there until 31st December 2016. Wah. 9 comment dlm beberapa kli visit. Dia kan cara dia I perasan kita komen setiap satu paragraph, tapi jangan semuanya dalam satu komen.